I just returned from visiting my brother-in-law in the hospital. He cut off 4 fingers in a table saw accident yesterday. Now i am very scared. I am going to get a blade guard. Any recommendations for a blade guard for the Powermatic 66? I religiously use a splitter already. To start, almost any blade guard on the market today, if used and set up correctly will help to protect you from harm. You have two options: either store bought, or shop built. Which ever one you choose, make sure it has dust collection capabilities. If you choose to build one yourself, plans are easily found on the web under shop built over arm guard. Check the Fine Woodworking archive as well. If you need any help in design or set up, please feel free to ask! Dan Kornfeld, Owner/President - Odyssey Wood Design, Inc. I also have one of those over-table guards, but seldom use it because it doesn't allow for ripping narrow pieces which I do a lot. Otherwise, it's a pretty good solution and, like you, I always use a splitter. Seems as though there really isn't a good all-round solution. Standard guards don't suit cutting thin strips but it's not difficult to make a guard/featherboard to make cutting strips safe. My learning days in woodworking were during college summers employed in a wood shop where fortunately for me the owner was very safety concious and had a good training and safety program. I spent weeks cutting 1/4 inch strips of yellow cedar and black walnut - millions of feet. The boss had made a guard/featherboard that clamped across the table from the right side and attached to the fence. I just had to push the wood through - couldn't even see the blade, and just about impossible to cut myself. I recall the beginnings of my tablesaw experience when a piece of plywood began to kickback and then suddenly flew up into the air and away from the saw. The boss had been watching me and when the kickback started he had kicked the board up and out of my hands. He said "Don't use the saw again until I have spent a few hours with you". He trained me well. In that shop hand outlines with fingers missing were painted in red on the saw tables to keep us thinking safety. To rip narrow stock with the over arm guard protectively in place, you will need to fabricate an auxiliary L-shaped fence and a modified push block. The push block should be made out of 1/2" plywood - 6" x 9". On the side of the left rear corner screw a piece of scrap (1/2" x 1.5" x 1"). Mount some sort of handle to the top of the block (a block of wood or even a large dowel in a block will work), locating it as close to center as possible while still being able to clear the clamps on the fence. Use a paste wax to slick up the bottom of the push block and other plywood rubbing surfaces. You are now ready to cut some wood! Use a ruler to measure the distance from the blade to the aux. fence for cutting width. With this system, your hands never go close to the blade, and the Grip-Tites guard the blade. You use your next piece of stock to push though the currently "working" piece of stock, and just keep pushing that way until the last piece is in, then use a scrap piece to finish off with. I have seen this demonstrated with pieces as narrow as 1/4" being produced in rapid, clean, safe fashion. It's the safest way I've seen to rip narrow pieces between the blade and fence. I don't believe the Grip-Tite system is the 'other' option fg. It's surely just one that might be considered? The safest method I've come across to rip multiples of thick or thin stuff is a power feeder added to a powerful saw, i.e., 5- 7 HP and up-- the power feeder being a tool generally beyond the budget of most amateurs. The GripTite system seems to have some attractions, but I don't think I'd spend much time with it as it seems to be an attempt to sidestep the fundamental safety option of the short style rip fence, riving knife, and crown guard. No-one (that I can recall in this thread, so I may be mistaken) has mentioned using a short rip fence for ripping, whether it be for wide or thin stuff, allied to a decent riving knife and crown guard-- items and options not available or fitted to US style saws, although I think Venecia mentioned these latter items. Slainte. What exactly is a crown guard? Dave, a crown guard is a device attached directly to the riving knife (in most cases) and can help in preventing the wood being thrown back at the operator. In a potential kickback circumstance the crown guard can provide last moment panic movement to turn off the machine. The riving knife resembles a US style splitter but is much more substantial and attached directly to the rise and fall mechanism of the saw blade. It looks as you should be able to see in the attached image. Slainte. So how does it shut off the machine? Is there an electrical connection? dave, a riving knife doesn't shut off the machine, but it--- along with a decent crown guard--- does have a significant role in reducing the chance of kickback, as the lively discussion since my last visit here illustrates. Slainte. I agree that no one mentioned a riving knife, crown guard and short fence. But if you go to post # 6 you will see I posted a picture of all those on my saw and mentioned with all the "goodies" I added. You did broach that subject indirectly, sarge. I failed to open your attached images to note that you had started that conversational thread. My fault. I'm not very good at opening attached images for one reason or another. Sorry. Slainte. As far as you not being good at opening things, I dis-agree. You seem to be "world-class" at opening malt beverages. Apologies not necessary as hopefully a few might have learned something here. Your comment to Scrit was "on target" about opening up something that has been covered time and time again. There always seems to be a new audience though. Like teaching, they come and they go. As soon as you think you have the word out, a new group shows up to take the place of the graduates. I'm just glad I was in one of those groups and came away wiser. Your article in the Dec. Furniture&Cabinet-Making should be on the stands soon. Looking forward to it. BTW, did you end up selling the Wadkins before you returned or did you ship it over? Just curious..
Yep, Sarge, I did sell the Wadkin in the US. Far too big and heavy to ship over, and it probably needs a different motor. Wadkin kit is as common as muck in these parts anyway so it'd be easy enough to buy a secondhand one. Funnily enough, when I walked into the workshop at my new job I was surrounded by Wadkin machinery, including a CP12 version of my saw which was the bigger CP16. Apart from the saw I had in the US I hadn't used Wadkin kit in ten years, but it was just like riding a bike--- all the knobs and controls are right where I expect them to be, ha, ha. You're correct, I've seen a lot of names come and go in this forum over the years and there always seems to be a new audience coming through. Enjoy the article. It's not a 'how to' thing, more of an aid to selecting a type or style of drawer making for the job in hand. I'll nip that saying sorry thing in the bud, then, eh? You prefer my pungent, in-yer-face character, ha, ha? Lots of Heineken Cup rugby to watch this weekend-- about six game on the telly, so that'll keep me busy and mostly out of mischief. Slainte.
" You prefer my pungent, "in-yer-face" character"? I have some vague recollection of you describing the stack dado as, " inspired lunacy". I always wondered what it is about the dado blades that make you all so leary of it. If you take off less than 1/4 " at a time, and the blade is on the other side of the board, exactly why is it so dangerous? You quoted me pretty closely from about four years ago Frank. I think I said the words, "Desperately inspired lunacy," and I'm pretty sure I was refering in particular to the technique of creating coves and the like by passing the wood at an angle over a blade using an angled piece of wood cramped to the table as a fence. I tried that trick once at the behest of a well meaning shop mate, and I won't be trying it again in a hurry. I'm already missing the ends of a couple of fingers, and I'd like to hang on to the ones that are left, ha, ha. The lively discussion since your post seems to address most of the concerns about using a dado blade and I don't think I have much to add, except to say that those tools do have something of a reputation for causing injury. Still, similar blades are run in spindle moulders, but in that case there is usually added guarding and tunnelling rigged up. Most saw operators using dado blades seem reluctant to create similar guarding, but that might be due to the 'hurry-up' nature of the job in hand, or maybe a lack of appreciation for the inherent dangers of using such a tool. Slainte. felder have a nice unit with a vacuum hose outlet on the top, you might have to make a bracket for it. Feel bad for your bud, but thats why there is a guard, if only to tell you where the blade is! This may is not relevant to your question but how did he manage to cut off "4 " fingers? I can see cutting off 1 or 2 but 4 takes some doing. Was it extreme carelessness or extreme bad luck? This is not morbid curiosity - knowing the precise mechanism helps me to be safer when using my own saw. Like most woodworkers, I took the guard off my saw and even though I am not advocating this, it does force me to keep my attention riveted on the saw blade at all times. With a guard in place, I wonder if I would have a false sense of security about the saw. Just a thought. This is one of my personal nightmares, amputation. I've got near a couple of times but been lucky to come away with only stitches to show, thank goodness. I feel genuinely sorry for your buddy. Perhaps this is a timely reminder to all of us, pro and amateur alike, to think about safety before we make that cut. After all, guards are there for a purpose. For what it's worth there is this site with a good home made design for an overhead crown guard, although I personally think that this parallelogram linkage guard is pretty neat. For those who want to learn a bit more about safe working with circular saw benches, take a look at this PDF on the HSE website. Yes, I know the site is not American, and it certainly seems to contradict what Uncle Norm does, but the advice given there is first class (it also shows how to use overhead crown guards safely). Call 911 imediatley!!! Do not drive your self or have someone else drive you let the pro's do that.Do not use frozen peas or wrap them around the amputated part,frozen parts can't be re-attached.Place them in a clean bag or towel ( middle of paper towel roll). Wrap loosely then wait for ambulence. "With a gaurd in place, I wonder if I would have a false sense of security"? I saw the photos you posted in response to Dave's accident discussion. The photos are dark and hard to see. Would you take some more pictures and post them where we can all find them? 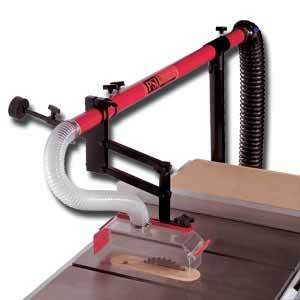 I notice you are using a BT3000 like mine and I am always interested in safer ways to cut wood. Perhaps a discussion of the use and purpose would be in order. Sarge, I was going to say somethin' too -- for instance "Hey, guy, set up those halogens when you're picture-taking. Your stuff is wonderful and we want to see it in all the best detail!" Do you have some halogen work lights? "Do you have any halogens"? The only time I tried to use them I was using a cheap polariod. Everything came up amber. I'm not to much of a photographer. I could try the halogen with the better 35mm auto I started using. Don't know what will happen as I probably won't invest in an expensive camera. So, I'm a lousy photograper, huh! ha.. ha... I won't have time to take any new pics before the first of the year. I'm in the middle of our annual "build 400 toys for needy kids with donated scraps" project. The 14 of us (used to be 6) are getting to the 300 mark, so I may finish soon this year. We may have enough time with the extra people and scraps to go over 400. This is a my immediate priority. If you will e-mail your mailing address, I will put them in an envelope and mail them though. I have a few others that might be helpful for your intended purpose. Yep, it's a BT-3000 for sure with a few gut and surface modifications. My best friend is a mechanical engineer and my BIl is a shop foreman in the machinist shop at Delta Air Lines. We did a "wee" bit of modification with what is a good basic design that needed beefing. If you have questions, ask. I have time to check the forum in the morning b-4 I go to my part-time job. I also get on late after finishing in the shop. Getting through earlier this year with the extra people. Used to be a 2 AM every nite deal. What he actually did is not entirely clear. When I saw him he was just coming awake after 11 hrs of hand surgery. It wasn't the time to ask. If you dont want the gory details stop reading now! He cut off thumb and all 3 fingers but pinky. Middle finger has been reattached in what he describes as a permanently defiant pose. Because the body went into shock and restricted blood flow to his extremity there is risk he will still lose the pinky; though right now that seems unlikely. There is talk of attaching his big toe in place of the missing thumb. How did he do it? I'm not entirely sure but here is the little i know. His adult son says the accident occurred while performing a drop cut. I suspect that means he rotated the board down onto the blade. I do not know if the blade was higher than he thought or if he was the victim of some kind of kickback; i expect the latter but really do not know yet. How many times i have experienced an accident or heard of an accident where it happened knowing full it was going to be trouble. . . I find myself wanting to say to myself and immediate family that this happened cause he did something that i would never do. Seems like a dangerously slippery slope . . . He has way more woodworking experience than me. Worked as a pro in his younger years. Somehow he walked to the neighbor's afterwards to get help. His son went back afterwards and collected fingers and bone for the hospital. Thanks for letting me "process" a bit here on the forum. Kind of like cheap therapy! Every time I read or hear of one of these things I feel ill. I don't know if I feel worse for the unfortunate injured person or for myself, wondering if such a thing will ever happen. We all tell ourselves we don't take chances, but these things happen so fast, so unexpectedly while we think we are under control. And it is so very often on the table saw that these disasters happen. I dislike the TS so much, I do all the ripping I can possibly accomplish on my bandsaw. But there are some operations that only the table saw can properly do. I guess we all have our own tales of near misses, real events, etc, all so fast it was like a rifle shot. Like you, I use my bandsaw for as many ripping operations as possible. I use Timberwolf blades and a quality fence, and I get great cuts with no drift. I then clean up the slightly rough edge with my router or a planer. Also like you, I dislike table saws very much. Especially North American designs. The Euro-style saws are absolutely better, with their riving knives, but they are very pricey. I looked into Felders a while back, but they run about $5,000 minimum. Rojek, another good Euro saw, is a little less expensive, but will still cost you $3,500 by the time it's outfitted. Unlike you, I do not own a table saw. I make all kinds of furniture and cabinets, and I find I can do everything without the table saw. I use a Festool system instead. This system does wonderful rips, cross-cuts, and allows compound angles and tapers -- all done with near-total safety and great dust collection. I'm only saying this to emphasize that, for people who dislike the table saw, there is no absolute reason to own one.